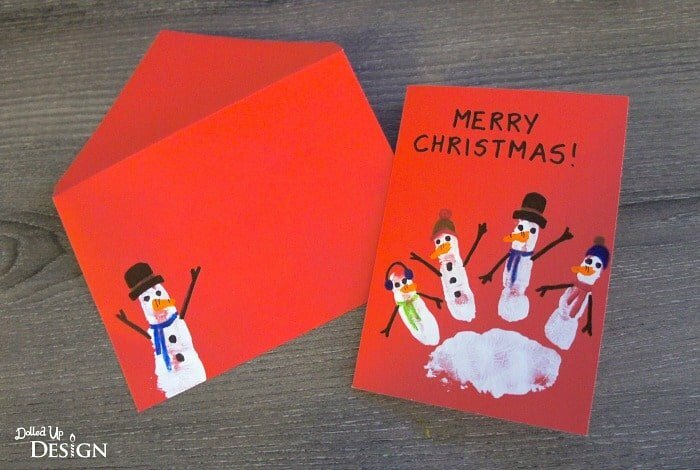 This DIY Handprint Snowman Christmas Cards tutorial is courtesy of our contributor Chantelle of Dolled Up Design…I realize it is still early November, but if you are anything like me you are already thinking about Christmas and trying to get things prepped and ready before December hits. If there are DIY projects I can create ahead of time, it makes it a lot easier once we are hit with all the Christmas concerts, parties and extra visits to family and friends. While I don’t bother to send out yearly Christmas cards, there are some gifts I like to include more than just a gift tag with. The graphic designer in me really loves greeting cards, but I also struggle to spend money on them when I could put that money into the gift. When I needed cards for the kids teacher gifts last year, instead of just picking up a box of Christmas themed cards, I spotted these great multi-packs of blank card & envelope sets at Dollar Tree that I knew could be transformed into something cute and personal. 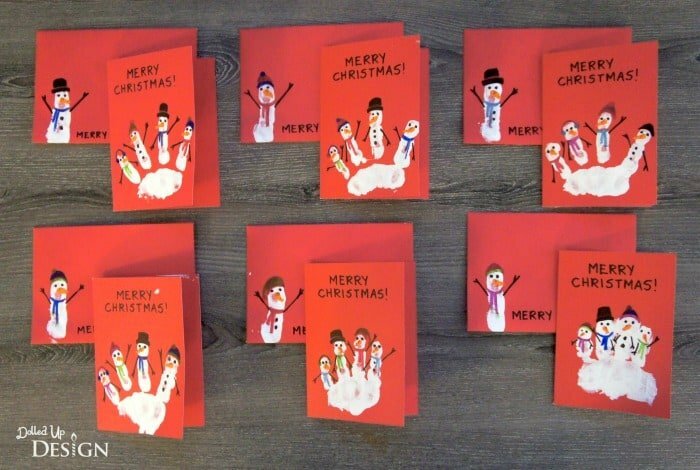 To make my handprint snowman cards, all that was required was some white acrylic paint, a paintbrush and assorted colors of permanent markers. I simply painted the white paint onto my children’s hands and had them press down onto the card with slightly spread fingers. Once our painted handprints were fully dry, I then transformed each finger into a snowman by drawing on arms, faces, scarves and hats with assorted Sharpie brand markers. 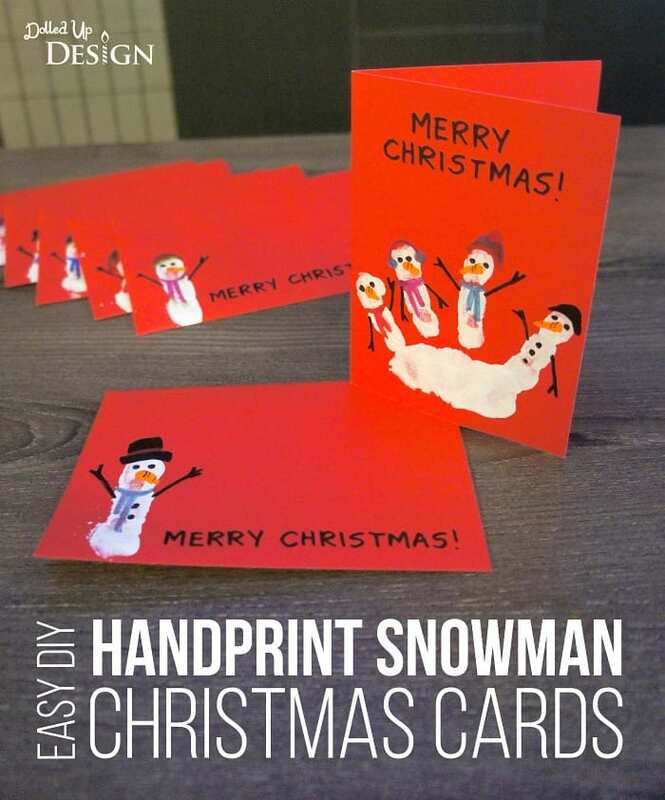 If you don’t having a young willing assistant, you could definitely use your own hand – I ended up using my finger prints for the single snowmen on the matching envelopes. 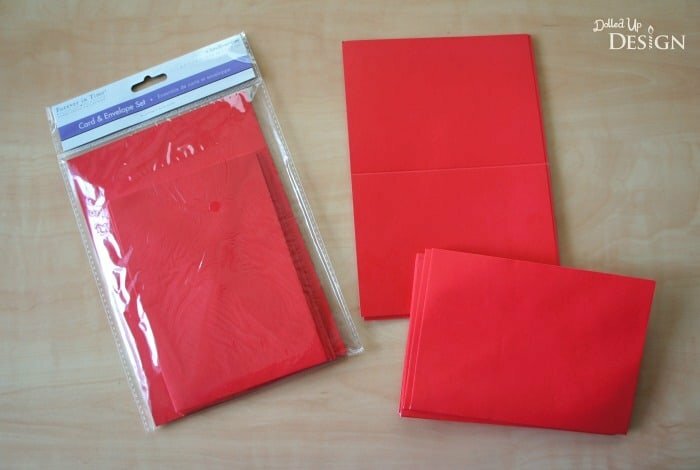 If you can’t find ready-made cards, you can always just cut and fold your own paper to create the cards. I recommend using a heavy cardstock or scrapbooking paper. The “Merry Christmas” message on each card and envelope was written simply in my own handwriting with a black sharpie marker. Alternatively, you could pick up a Christmas stamp from the craft store and put a nice holiday message on that way. You could also dress up your cards further using 3D accessories such as ribbon or yarn for the scarves, real pom pom’s on the hats, or gluing buttons or sequins on for the buttons. Let the kids get creative and have fun! 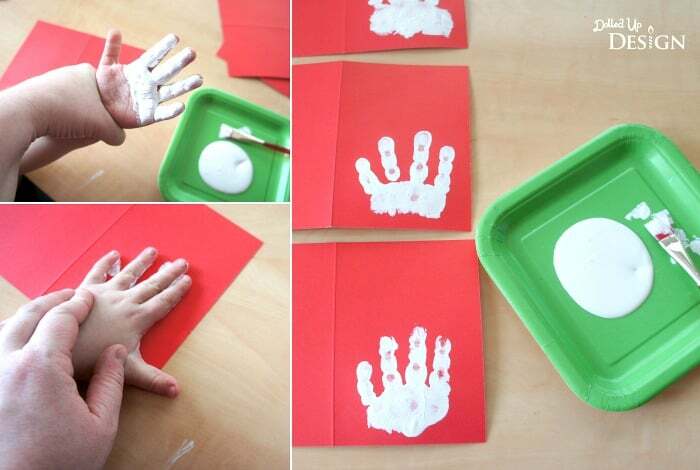 These snowman handprints are a great way to add a personal touch to your holiday cards. They are inexpensive, and I love that they give the kids a chance to get more involved in the gifts they are giving. 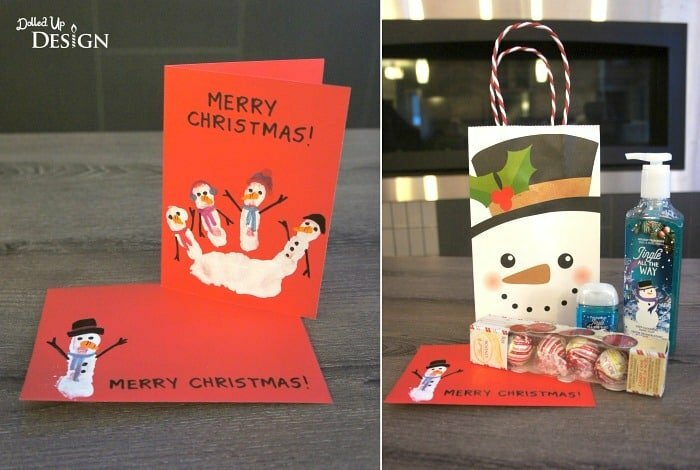 We’d like to send a big THANK YOU to Chantelle for sharing this fun holiday card idea with us! Her parties are always easy to recreate and kids love them! Be sure to follow her on Facebook to stay updated on all her fabulous ideas. These hand printed Christmas cards are very cute. And it’s a perfect gift idea for small children. How do you get the elf card to stand properly?